Rafael Nadal has won the Canadian Open final in straight sets. 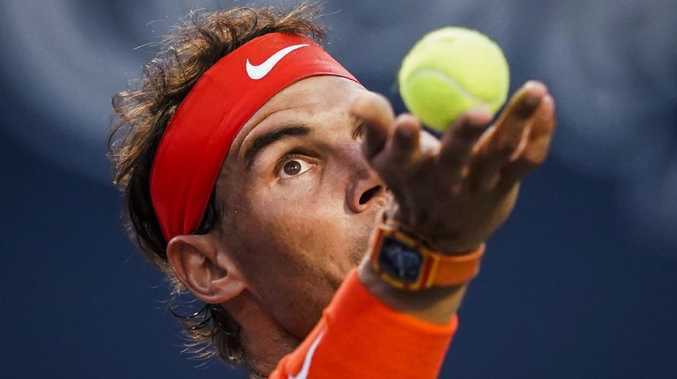 RAFAEL Nadal has claimed a record-extending 33rd ATP Masters 1000 title with victory over birthday boy Stefanos Tsitsipas in the Canadian Open final. Tsitsipas - who was playing in his maiden ATP Masters 1000 final on his 20th birthday, after four consecutive wins over top-10 players, threw all he had at Nadal but was ultimately beaten 6-2 7-6 (7-4). Much to the dismay of the many flag-waving Greek supporters in attendance, world No.1 Nadal denied a spirited challenge from Tsitsipas in one hour and 41 minutes to claim his fourth championship in Canada. "If you told me this two weeks ago I would not have believed it," Nadal said in his on-court interview. "It's a great way to start the hardcourt season. "Winning in Toronto is so important. You don't win Masters 1000s very often. "It's a very important victory for me and I'm very happy." Nadal broke serve twice in the first set on his way to sealing the opener in 34 minutes. "I got nervous, I played a terrible game," Nadal said. "But that's how it is. You keep going. That's part of the sport. "Today for me was an important match and I just made a couple mistakes but the positive news is I played my best match without a doubt." Nadal forced a tiebreaker where he rallied back from a mini break and sealed the win with a crosscourt forehand.